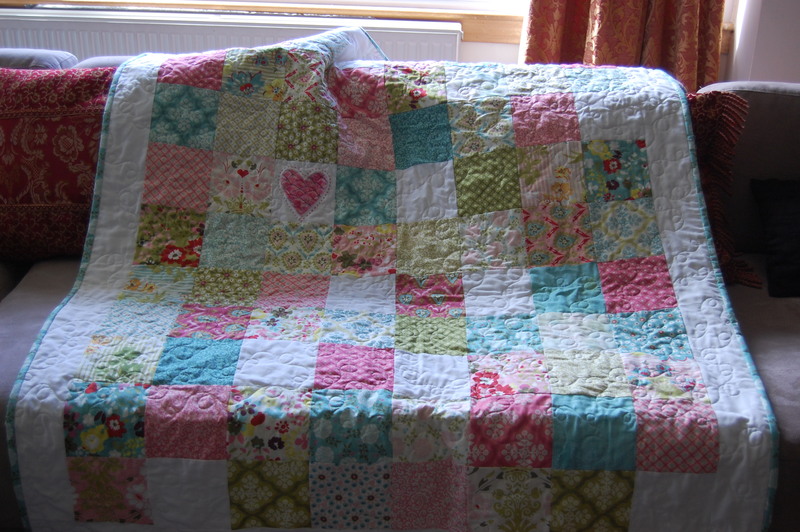 My good friend moved house recently and I really wanted to make them a throw quilt for their sofa. Their tastes are pretty clean and minimal; white, grey, subdued egg shell blue. They even manage to keep the children’s toys tidy! Ahem, yeah, just like me. 😉 And Ana seems to be slightly in love with the deer/ stag silhouette at the moment, which can be found in subtle places in their home – on a cushion, on a tea-towel and so on. 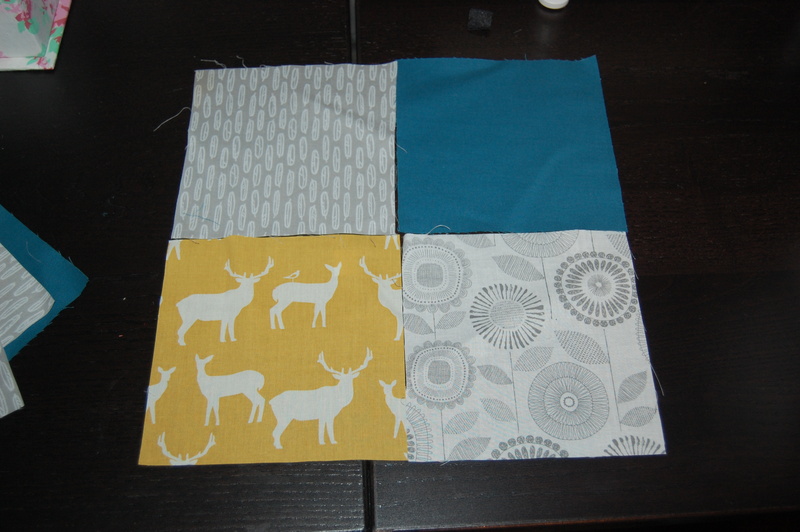 So I set off through the UK online shops looking for a set of fabrics with a grown-up colour scheme, but bright enough to lift a room or grace a picnic – and preferably with a few deer too. 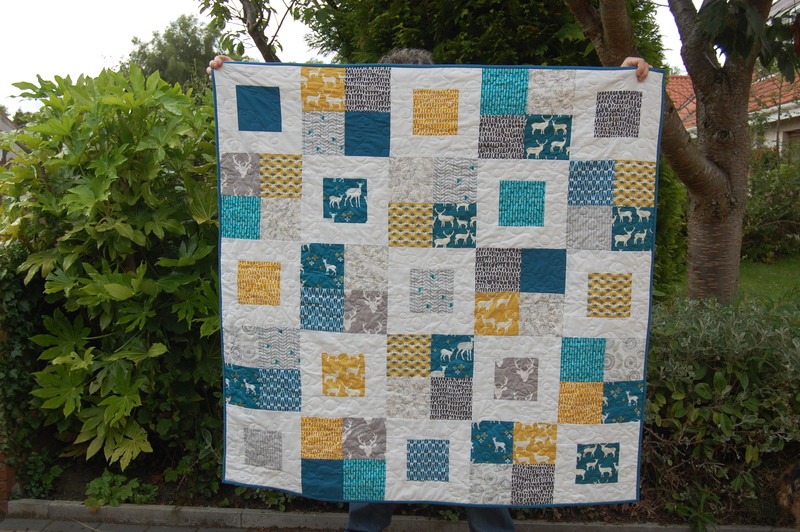 I have had this grey/ mustard/ teal colour scheme in my head for a while, and have been dying to make a quilt using it, so this seemed like the perfect opportunity. And, being the kind of fabric-obsessed web surfer that I am, I also immediately knew my best chance of finding modern, clean, grown up yet quirky prints. “M is for Make” is a really fabulous shop. The owner, Kate, has a definite style and fabric taste; the shop is full of modern, often geometric fabrics or stylised prints, but with a healthy dose of whimsy in there – not taking itself too seriously. Well I think so anyway – she’s like a “cool hunter”! 61 (sixty one) 6″ fabric squares. 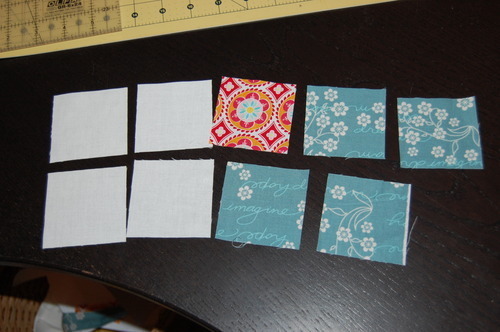 Assuming you have well-cut fat quarters and you can cut 9 (nine) 6″ squares from each one, you only need 7 fat quarters. Not all fat quarters are that well cut. 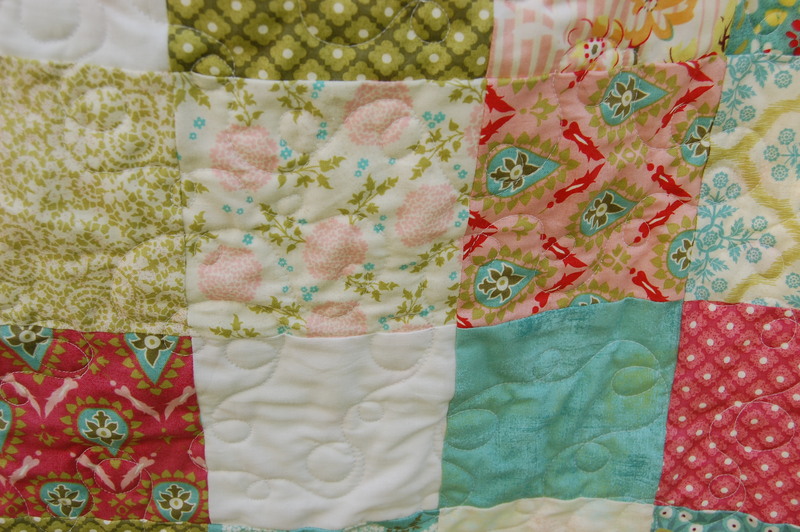 If you had more fat quarters, you would have fabric left over but would end up with more variety in your quilt. 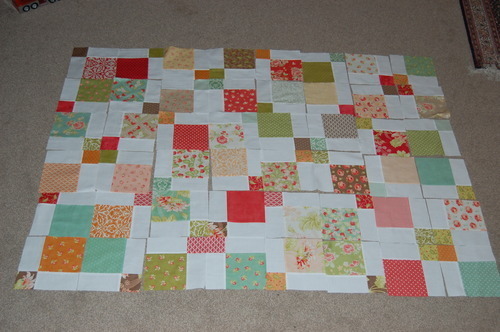 I had 14 different fat quarters and have fabric left over. 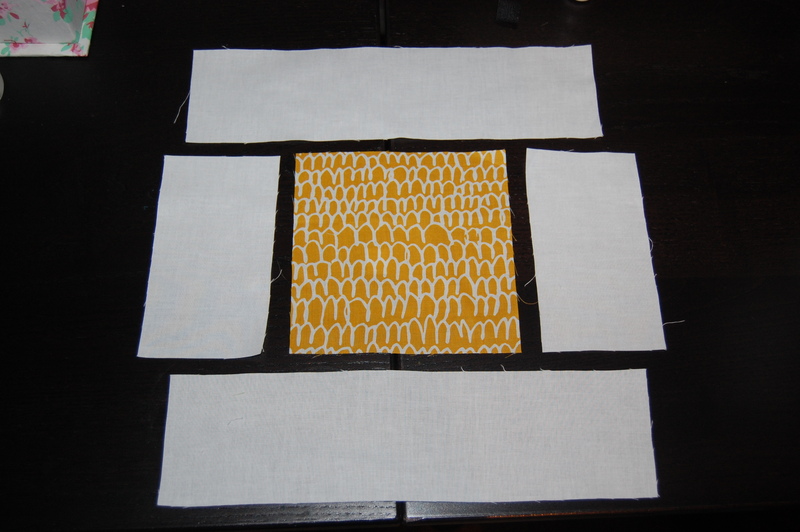 A yard of white background fabric, cut into 3.25″ strips. rotary cutter, decent ruler, thread etc etc you know the drill! 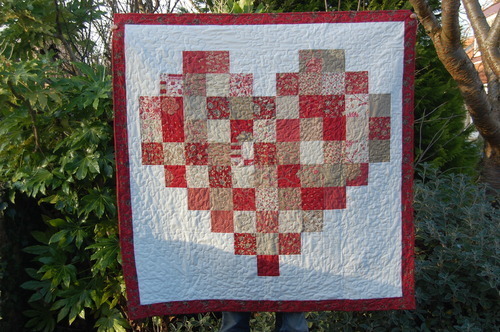 The quilt is made from 2 blocks. 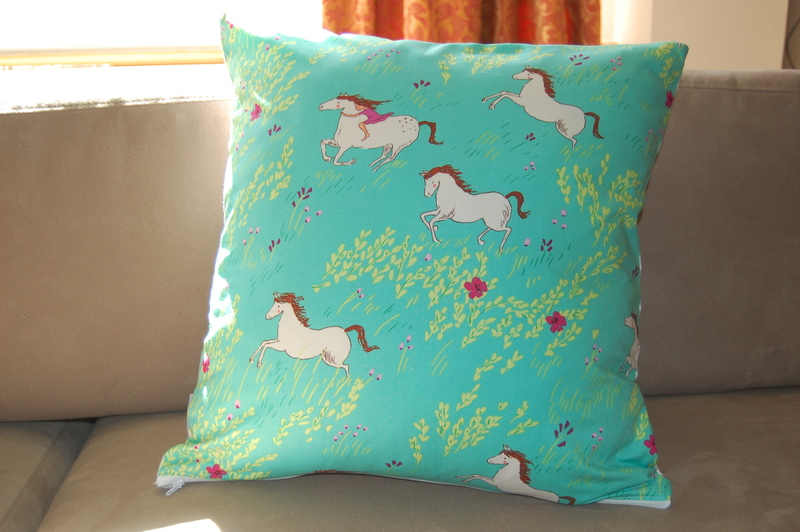 Sew everything together using a scant 1/4″ seam allowance. Block A is a basic 4-patch. 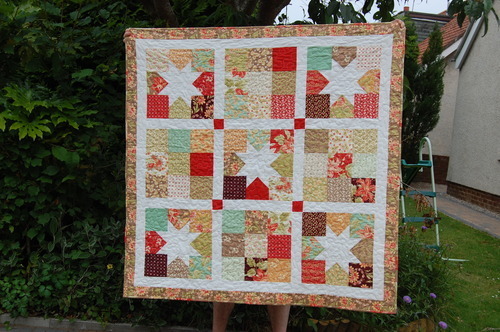 Take 2 of your 6″ squares and sew together, RST. 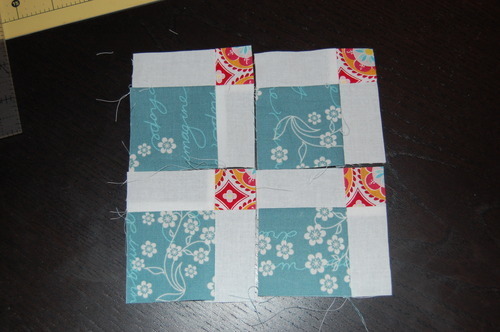 Repeat with another 2 squares , open both out and sew together into a 4-patch. You need 12 of these. You need to subcut your 3.25″ wide white strips into 26 (twenty six) 6″x 3.25″ rectangles and 26 (twenty six) 11.5″ x 3.25″ rectangles. 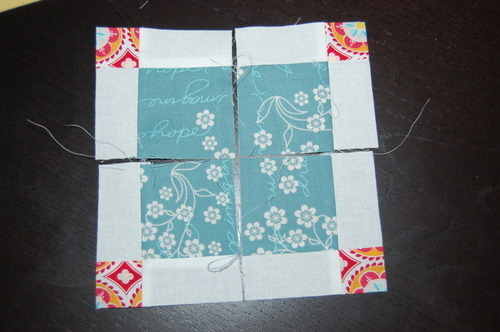 Then take a 6″ x 3.25″ rectangle and sew onto the side of a 6″ square. Repeat on the other side. 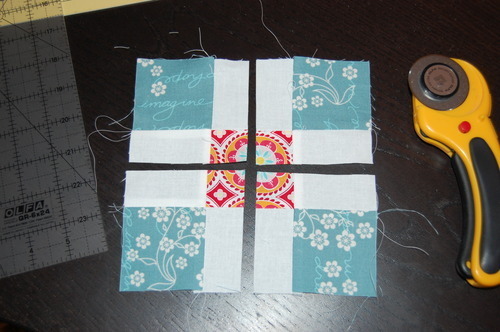 Then sew a 11.5″ x 3.25″ rectangle to the top and bottom, finishing the block. You will need 13 of these blocks. 3. Easy peasy! Really at this point you should check all your blocks are the same size. They should all measure 11.5″ square. but seam allowances being what they are when the fascist quilt police are looking the other way, they may not all be the same. It’s okay. 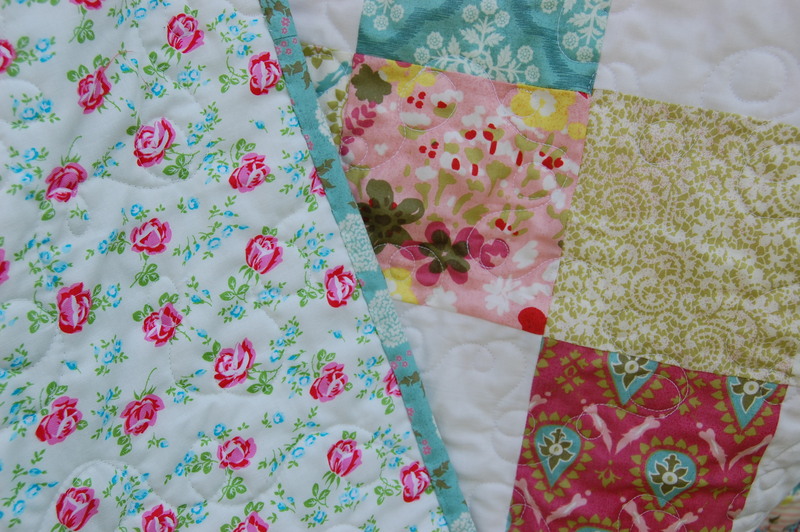 Find your smallest block and trim them to be all the same size; even if that is 11.25″ or 11″, it’s better than not being able to sew your quilt together or it not lying flat when it comes to basting. I decided not to put on a border, and just bound it in the beautiful Kona solid in teal. 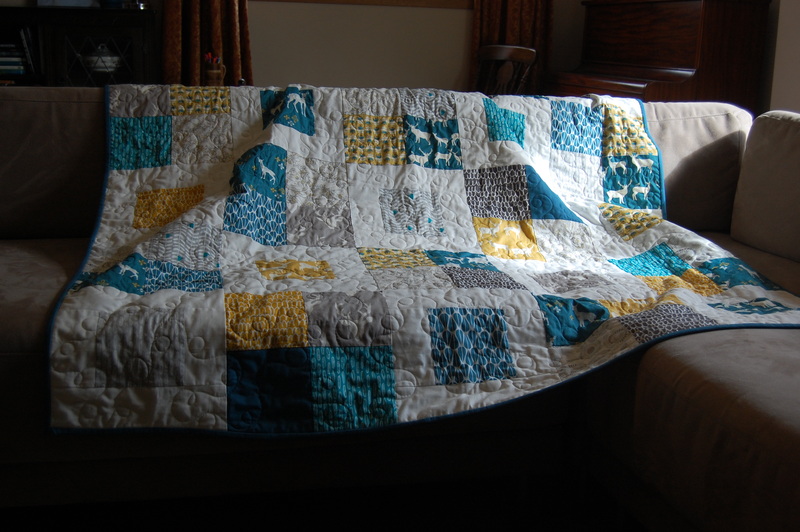 I used the number print from Ikea on the back, which looks great with this quilt – and such a bonus that it is 60″ wide, has a nice soft handle and is very cheap! 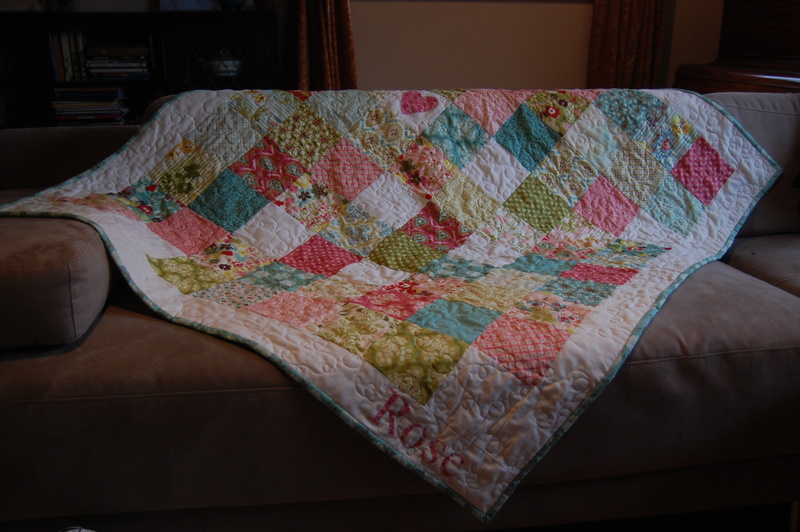 I used my favourite Quilter’s Dream Orient for the batting, which gives it a gorgeous snuggliness and drape, and quilted it in a freemotion all-over loop-de-loop pattern. 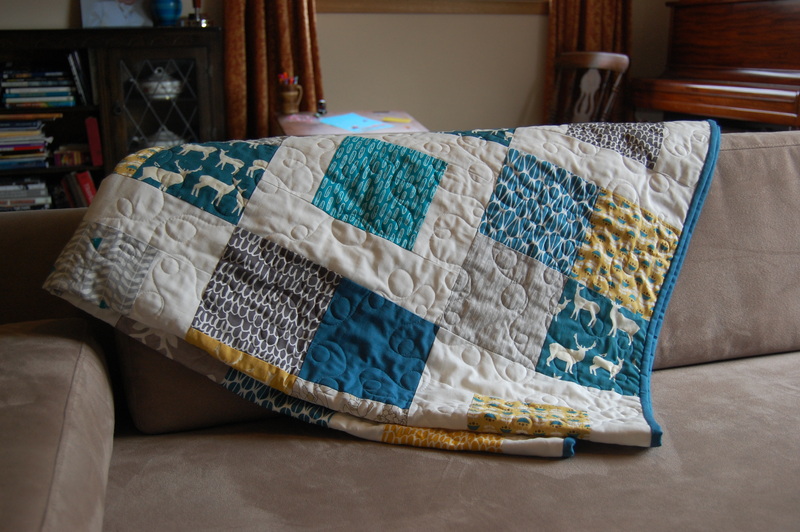 Obviously my house is not a Scandinavian inspired, white minimalist and modern looking house, so I appreciate that my sofa doesn’t suit this little quilt really -but I’m sure my friend’s sofa will! 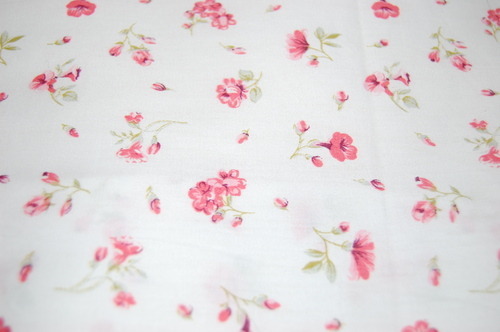 Oh I nearly forgot to tell you the fabrics! They were mostly from the collections Yoyogi park by Heather Moore for Cloud 9 fabrics, Mod Basics from Birch Fabrics, Westwood by Monaluna fabrics, the Kona teal and a lovely fabric from Botanics collection Carolyn Friedlander. 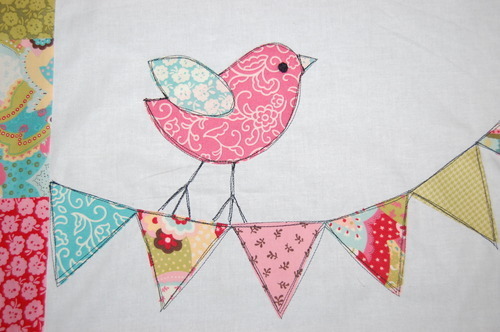 I could have just kept adding fabrics from that shop I really could, but tried to be restrained. Right, I had better get off to bed. Why does the bloggy muse always float by so darn late in the evening? 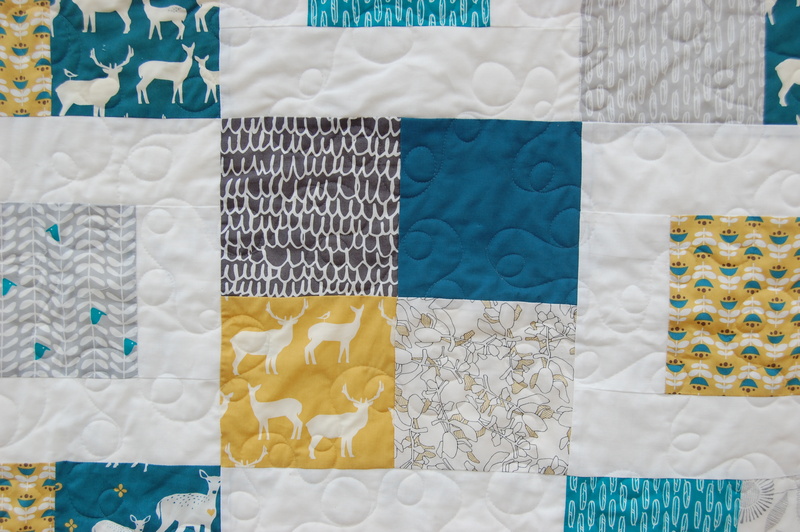 Hopefully my dreams will be filled with teal fabrics and peaceful deer tonight. May yours be too! … are the perfect combination. At least when it comes to quilts. See? Clearly I have no need to further extoll the virtues of the Hello Luscious collection by Basic Grey for Moda, but apparently I’m going to. I LOVE it. If it had a scent it would smell of jasmine, freshly cooking doughnuts, baked peaches in brown sugar and syrup and vanilla ice cream. Outside on a warm summers day with the smell of cut grass faintly in the background. And a Pimms for the grown-ups. Hmmm. Seems I’m getting distracted daydreaming about the Scottish summer (it’s June! I need a shaman to come and do a sun dance. we have plenty rain this year), so will move on. It’s such an old collection now that’s it’s super-hard to find. If you have any girls in your life and you find some, even one charm pack, snap it up because said daughter will always love it. 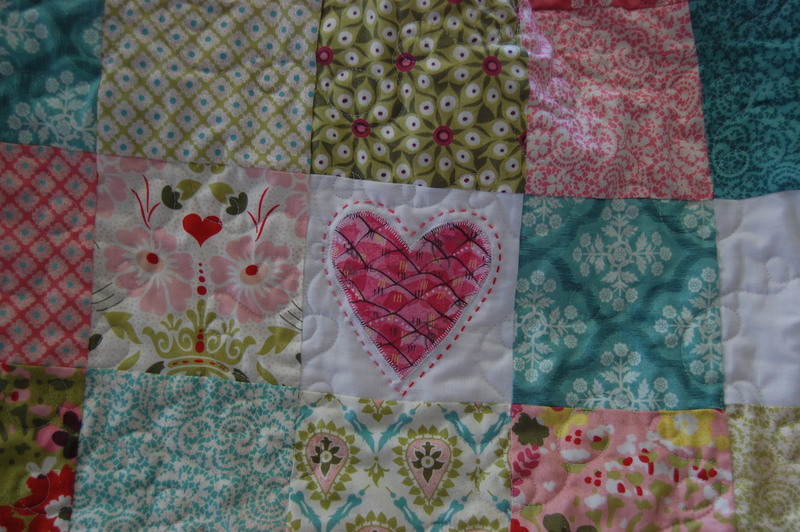 I stashed a few charm packs, despite having no daughter – I used 2 for this quilt. Pretty colours and patterns huh? Not too babyish and will grow with a girl until – well probably forever. Definitely late teens. 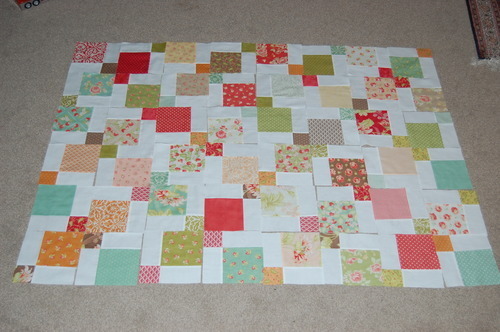 I did take out some of the greens and replace them with white squares (cut from stash). I’m not a huge green fan and although I like it in this collection, I felt the balance was slightly off for my tastes. And I feel the colours are so rich and well, luscious, together that they somehow can seem a bit “muddy” when all together – hence replacing the greens with some white. It definitely made the rest of the colours “pop”. 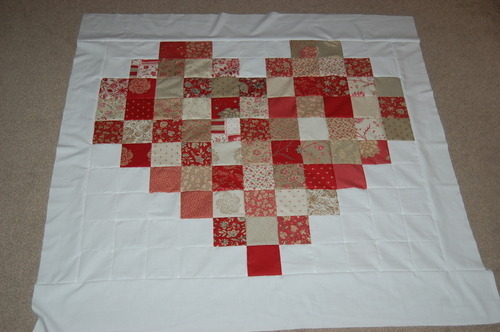 But after I made the quilt top I thought I had added a few too many white squares. 3 or 4 too many. I was on a deadline and really didn’t want to unpick. 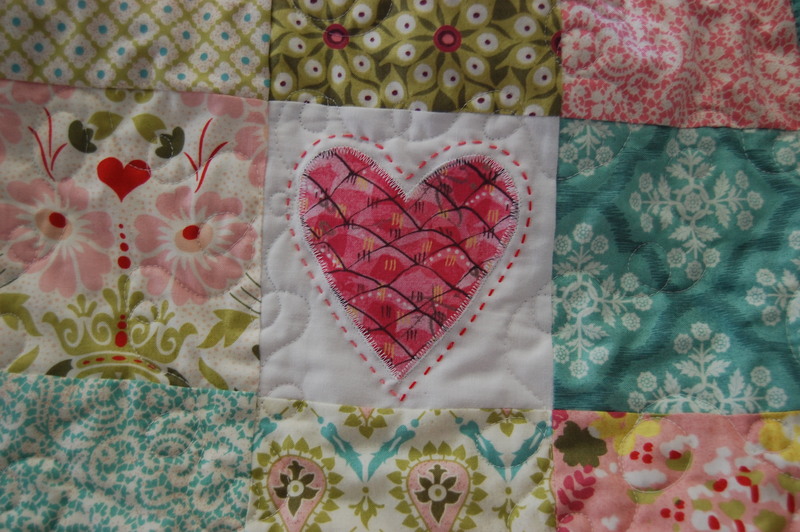 So I did a little applique heart using a lovely fabric from Cori Dantini for Blend fabric – So pretty… I have a quilt in the making in Cori Dantini fabrics, the colours remind me of a pack of refreshers, remember those sweets anyone? And somehow that heart draws your attention to it and away from the slight white square imbalance. Or I tell myself that! I really like it, and it felt like a little special gift to the wee girl. A little hand stitchery in a variegated pink perle 8 cotton finished it off. 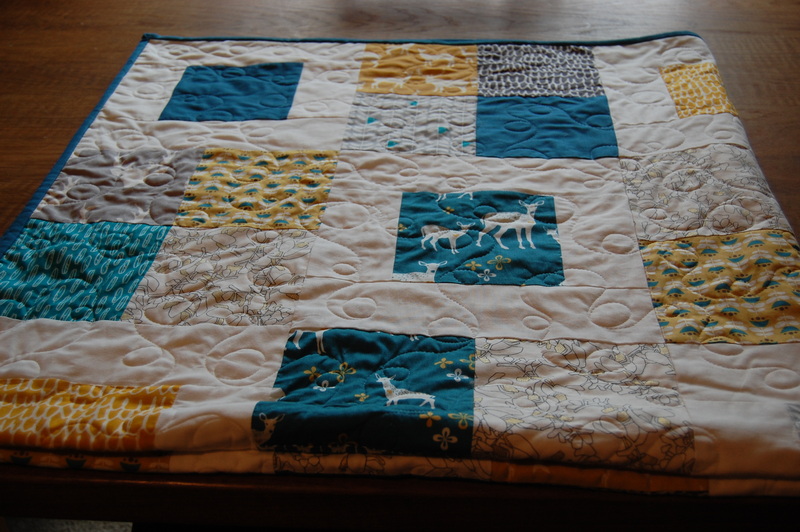 You can see the quilting on a few of these pictures; I did loop de loop quilting which I love on child quilts; actually I am beginning to love it on all quilts. Somehow the swirls and loops look fun and elegant at the same time. And it is a fun design to do – like when you are a kid, painting with bold flourish! Stippling is a much more restrained process; at least it is when you are trying to make it even and attractive. Backing is a Tanya Whelan print from Sugar Hill which actually goes really well with the collection, although I was unsure when it was first picked out. 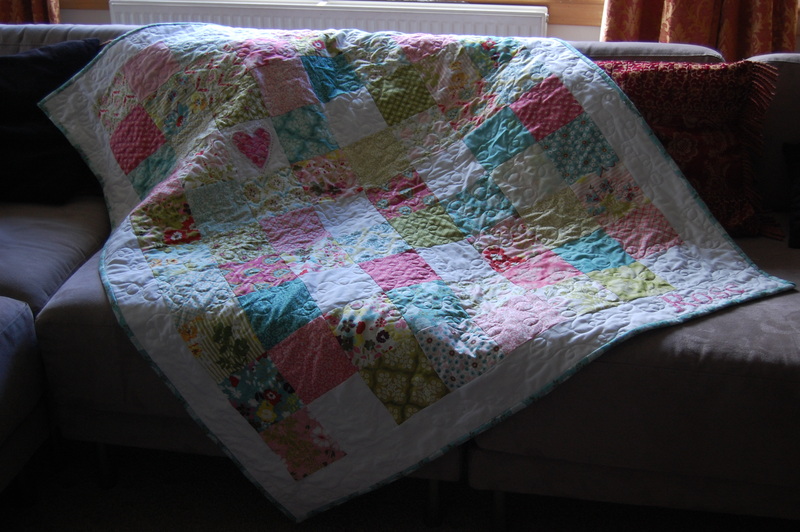 This quilt was commissioned by my neighbour for her very precious first granddaughter – a neighbour whom I adore so much that I was willing to relinquish a bit of my precious Hello Luscious stash – and her really lovely daughter and son in law. The baby girl (who is a cutie) is called Rose, so we were keen to have roses on the back; Suzanne chose this from my stash. And her name on the front of course – again in the Cori Dantini print above. Her parents gave this to her at a little party they held for introducing the baby (the baby’s family lives in Norway), and it was so great to see how much they loved it! 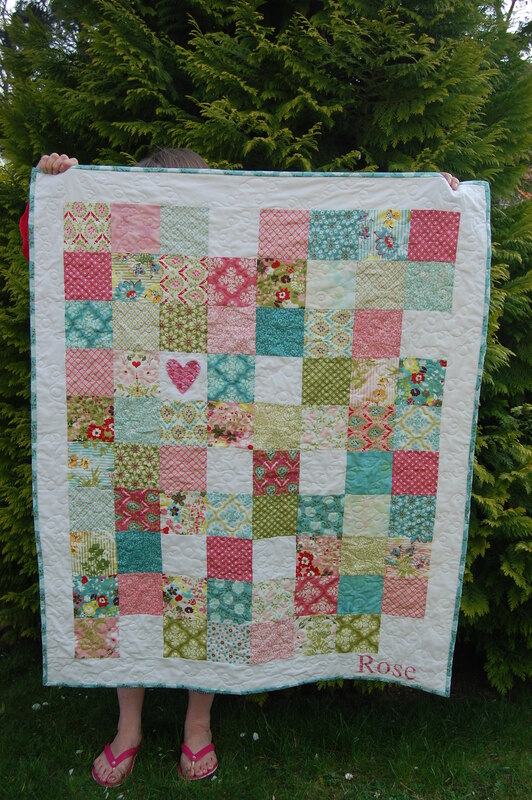 Incidentally I took a little present I made for her room – a quilted cushion made with a California girl charm pack (fig tree quilts for Moda) and Summer Ride by Sarah Jane on the back (I just love this print with a passion! ), which also turned out very sweet. 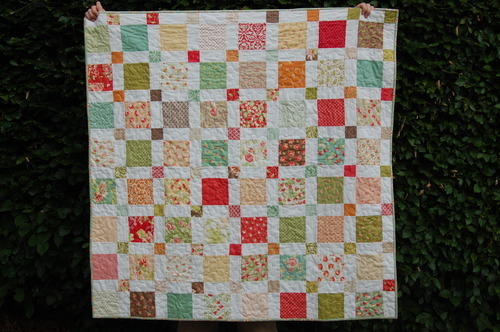 I was kind of sorry to see this quilt go, despite having no real use for it in my house, but I’m really glad it’s gone to such a good home where I know it will be used and loved by a darling family. Batting is Quilters Dream Orient, size approximately 46″ x 52″. Night night lovely creative folk; hope your treasure making is going well. for some time before sloping back inside. 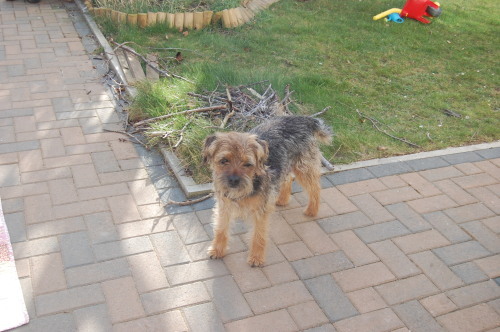 Wee cutie. apparently some big chewable sticks. Teachers… I’ve always had a lot of respect for them. And now even more. 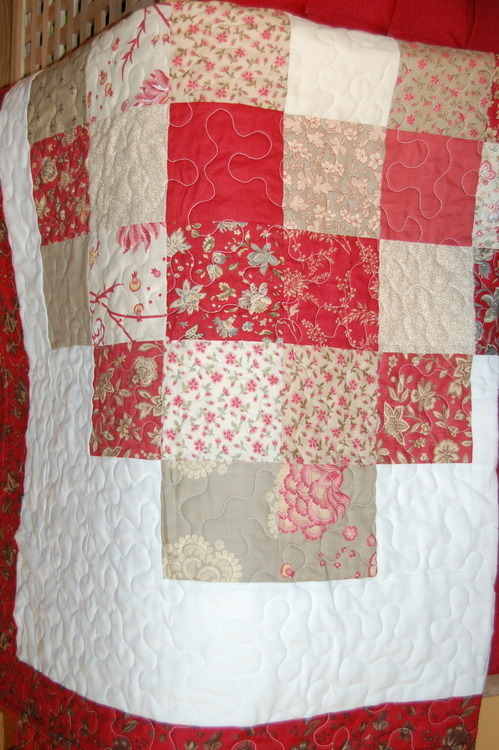 The fabrics are “Tapestry” by Fig Tree Quilts for Moda. 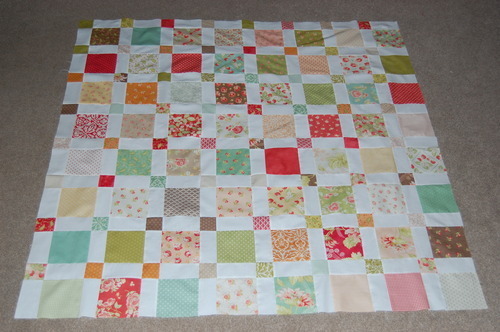 It used 2 charm packs (well, 77 charm squares to be exact), some white cotton and 12.5” of a border print. 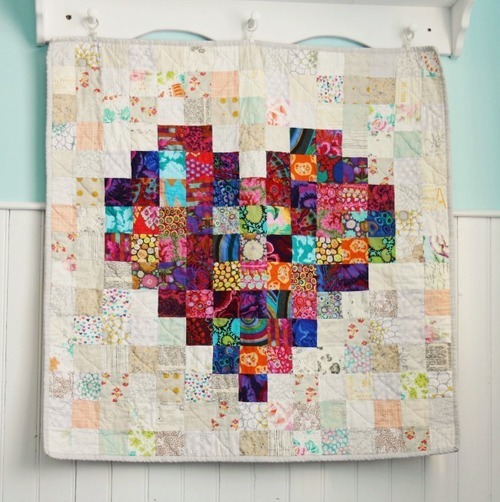 The fabrics are so timeless, as they always are with Fig Tree Quilts’ collections, but not as “sweet” as some of the collections; she lives in a farmhouse, so I thought this might fit in with that traditional feel. 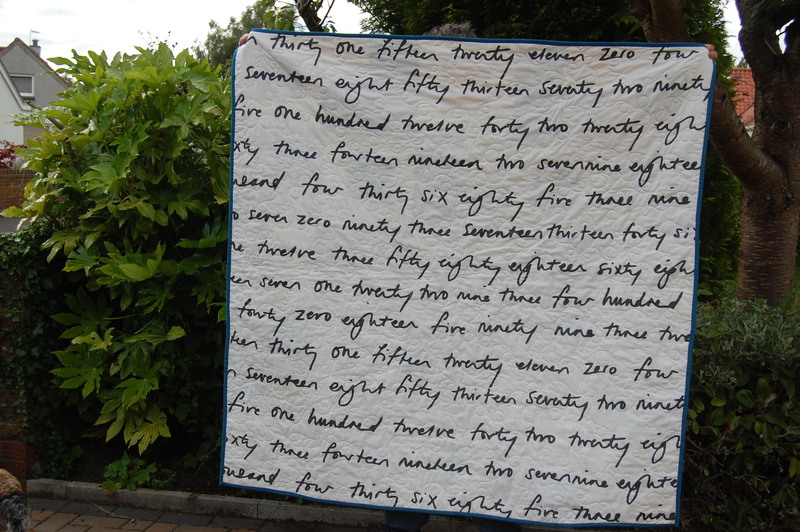 The quilt measures about 52” square. 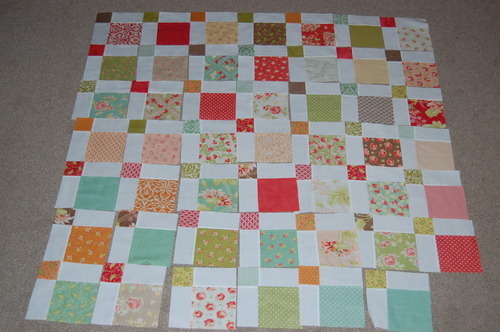 Do I have any regrets about this quilt? Did I preempt a “…brown border? ?” question which might have been forming in your head? 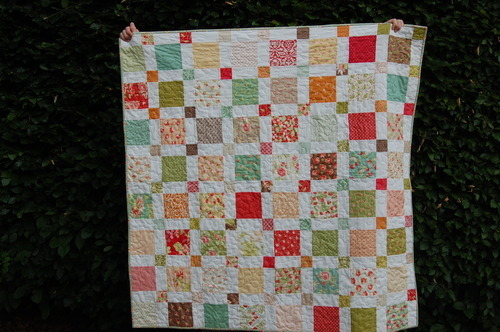 Well, although I like the quilt a lot, especially in our house and double-especially in the flesh, I can’t help but wonder if I might have preferred a different coloured border. I had some red, and some of the minty bluey colour. 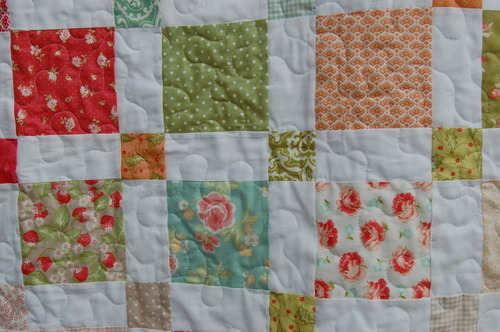 I think it would have changed the feel of the quilt completely. On reflection though, this will fit into a farmhouse better than the other options. I now can’t work out if that final answer is the truth or if it’s my natural “life’s too short to go round regretting small stuff you can’t change” mentality. I showed them to a few folk, and this one in particular stole several hearts. I bound it in a slightly retro feel blue floral from their “Whimsy” collection, that I had in stash, and it was perfect. 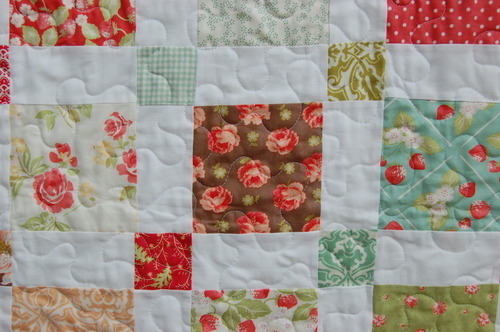 I hadn’t really thought I would like this D9P pattern so much, but quilted up it looked really great. 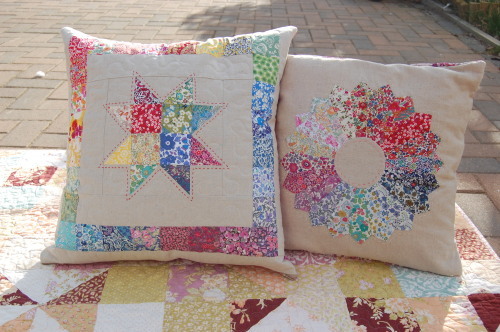 The top took much longer to make than the charming stars one, which surprised me somehow – silly really, you make blocks, cut them up and re-sew them – how did I not think that might take a while?? Both quilts measure about 52” square – lap size/ sofa throw size, perfect for those chilly winter evenings in front of the TV in Scotland. Both used 2 charm packs. 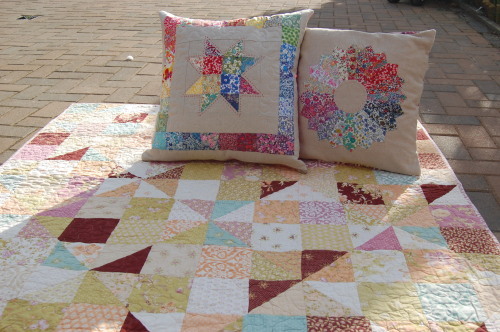 I used my favourite Quilter’s Dream Orient batting in both, for softness, warmth and washability, used plain white backings (to keep costs down in truth) and stipple quilted both. 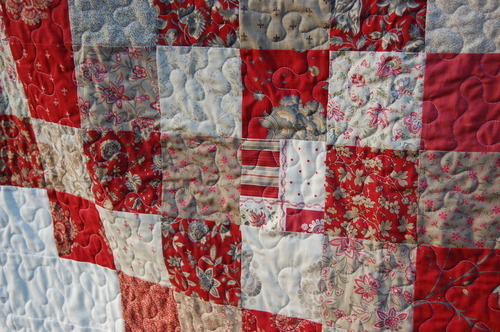 I resisted washing them, although I love seeing them all crinkly; in this country where the lovely crinkliness of quilts is not well known I think it’s better to give them looking “new” and let them wash them and acquire that beautiful antique look. For once I did put a label on saying thank you and the date – I hope they bring these wonderful teachers warmth and comfort for many years to come! 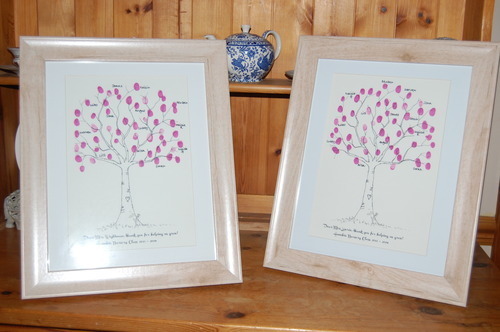 As an aside (kinda), all the other parents felt the same way about these teachers; the nursery parents got our kids together and did fingerprint trees, got them framed and gave them to the teachers all together on the last day of nursery. They were so touched. All very emotional, but in a good way. I downloaded the finggerprint tree here – edited the legend in Microsoft “Paint”, printed on some nice ivory card and used a lovely non-toxic ink called Tsukineko Memento ink (colour Lilac Posies). The kids did 4 fingerprints each and I wrote the name by one of them. We all really loved how they turned out. Hello you lovely craftilicious folk. 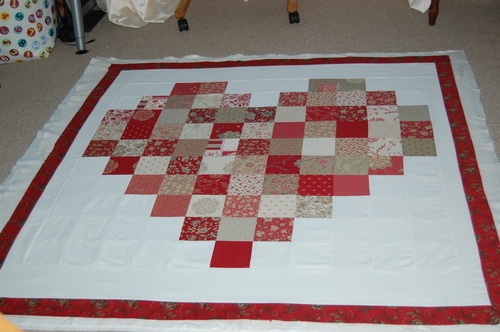 So I’m in the process of making 2 more charm quilts – and I’m a bit close to the wire with this deadline. Hopefully by next time I will show you them both finished (or I would have had a deadline fail…actually I prefer the words deadline unsuccess). 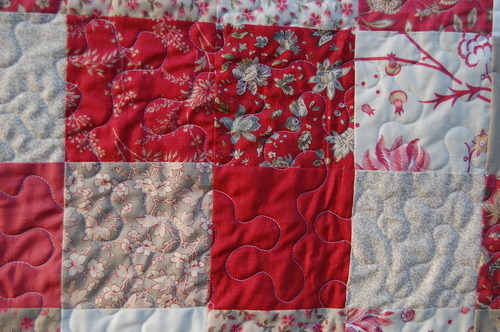 For quilt 2, I have been playing with the Disappearing Nine-Patch a.k.a. D9P. 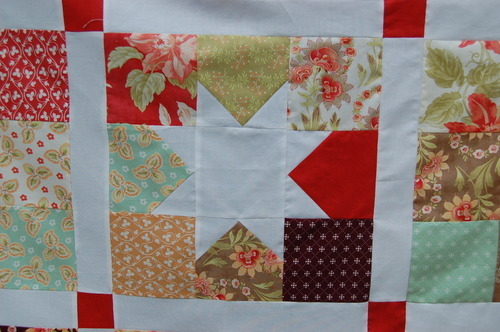 This is a pretty common block, and all over blogland, but it’s easy and makes quilts which look more complicated to make than they are. 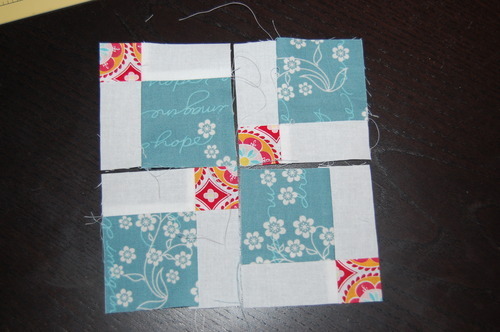 Just in case you’re not too familiar with it, I did these “show + tell” pictures with some 2.5” scrap squares. 1. Start with making a nine patch. 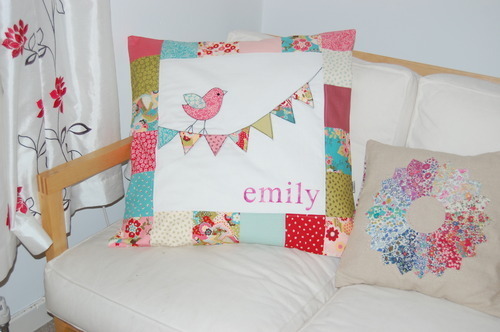 You can use all prints or solids and prints. I decided to use prints and white solid. 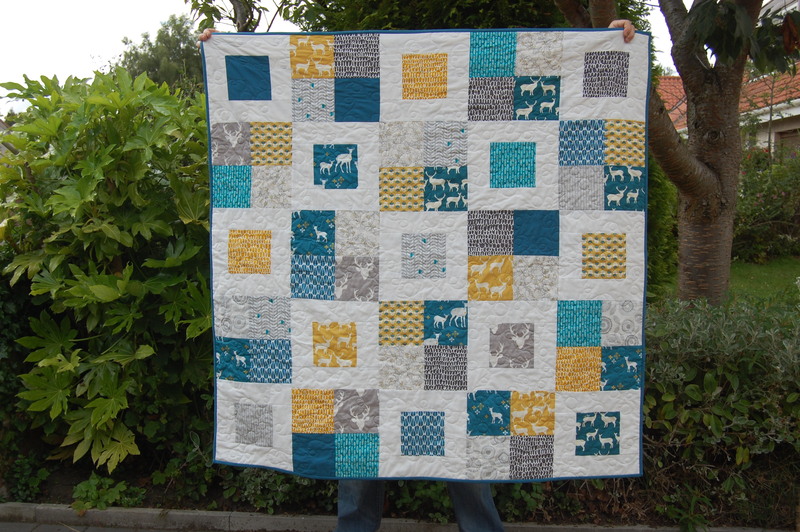 You need 4 squares of white and 5 prints (my prints were all different in my real quilt). 2. 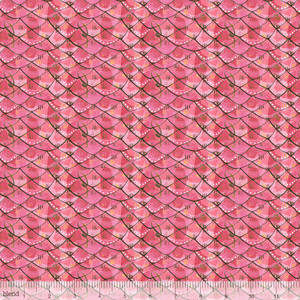 Sew them together in rows as shown below. The middle one is special as you will see, but in my real quilt it was just whatever randon charm square came out of the pile. 5. Play with your new blocks! See what has happened to the middle square? 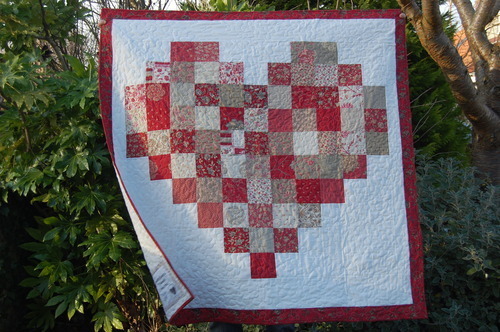 It has become the littlest square in the block and will be distributed more widely throughout the quilt. You might use this in your thinking in some quilts. That was the layout I eventually used. That picture is a very common layout. 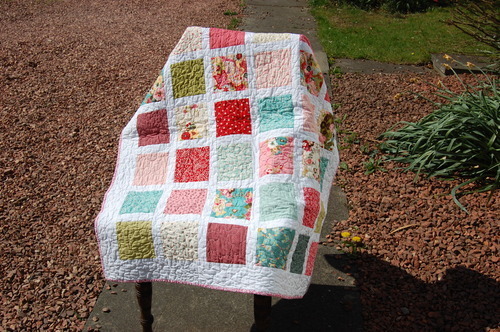 I once did a baby quilt in that, again using white solid ( https://www.flickr.com/photos/cuckoo-blue/8048473613/ ). In fact, I’ll just show you how they look. I took pictures of the different layouts whilst I was trying to decide what look I was going for. Make 16 nine-patches as shown above, and slice into quarters. 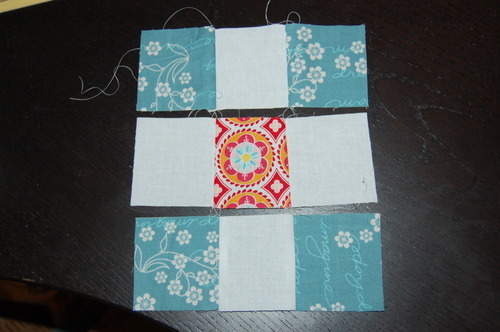 At this point you should trim your blocks to make sure they are the same size. Mine were pretty much the same, so I didn’t bother out of sheer laziness, and I just tried to match up the seams well when I was sewing. And then play! Until you get a layout which pleases you. 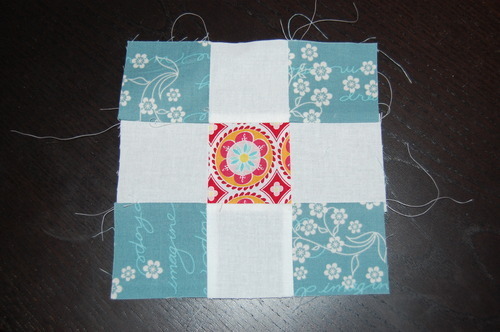 Next, I alternated the blocks between a square above and a reconstructed nine patch. 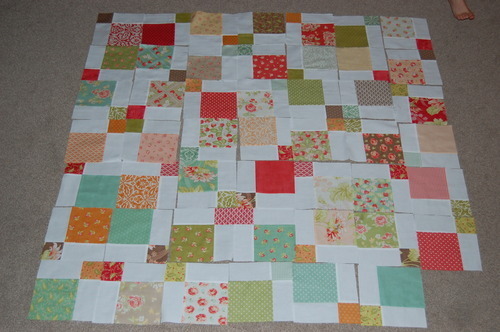 I think on a bigger quilt or one with more blocks it would have been a more obvious “chain around the 4-patch” look. At this point I realised that with 12 blocks I was better laying it out as a 3 x 4 block grid, so here is that same layout with the pattern a bit easier to see. And finally, this is the one which almost won out. It looks pretty scrappy, but it is organised chaos! In the end I decided to go a safer, less complex pattern as it is for someone else. There are more options of course – you could take each D9P 4-block unit and sash it in white – 2.5” strips or smaller would be nice, choosing any of the layouts above for it, or mixing it up with a traditional nine-patch. And, as you can imagine, if you use all prints you get a very scrappy look! 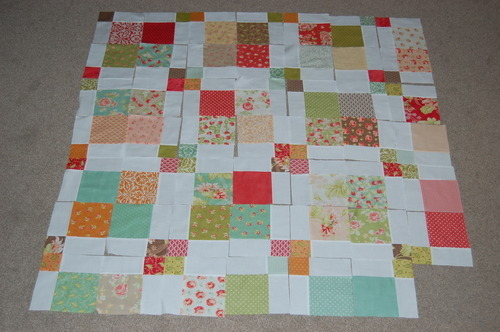 5” squares would be too busy for me in that case – but 10” (layer cake) squares would be perfect! You could even just place them randomly. OK, well again it’s wayyyyy past my bedtime. 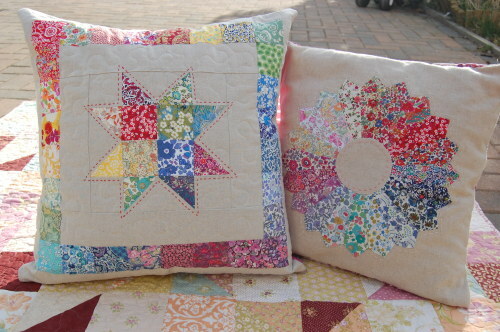 Hopefully next time I can show you these two little lap quilts finished and we can do some prettiness chat! 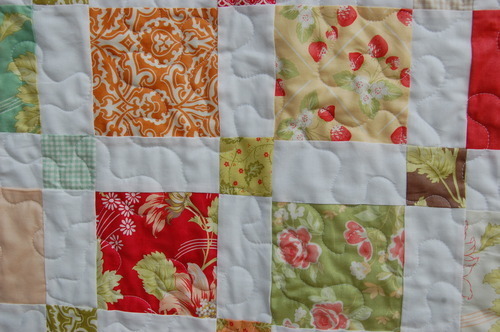 By the way I used a charm pack of Strawberry fields and one of Honeysweet, both by Fig tree Quilts for Moda for this quilt. Anyway, she’s one all of a sudden. Yeah, I did mention it was a year ago, but you wouldn’t believe how fast that year has gone, not to mention I am in denial that time is passing this quickly, whatever my grey hairs are saying. And I rather suddenly needed to think up a present. I can’t tell you how much I love this wee girl, she’s just too adorable for words, so I felt like making something special. 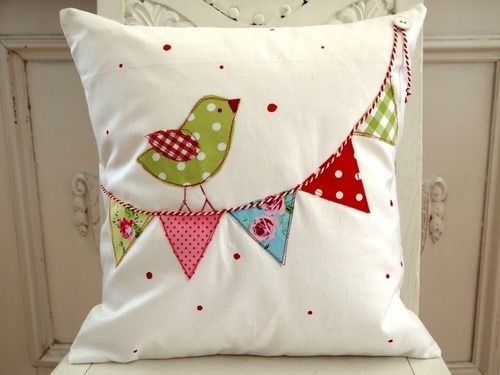 It’s been years since I did any freemotion embroidery (I did some bags with birds on very similar to the above and sold them for charity), so wanted simple but effective. 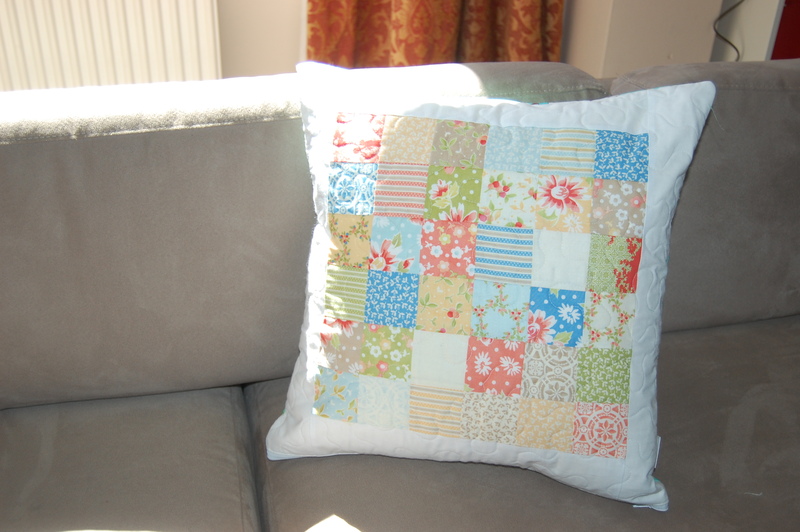 I had a 26” x 26” cushion inner from Ikea – these are a great size for a reading pillow in bed by the way – and another moda charm pack in sophie, to match Emily’s baby quilt. I cut a 17” square piece of white fabric and chose some charms to cut into 2.5” squares, which I used to cut into the bunting flags. 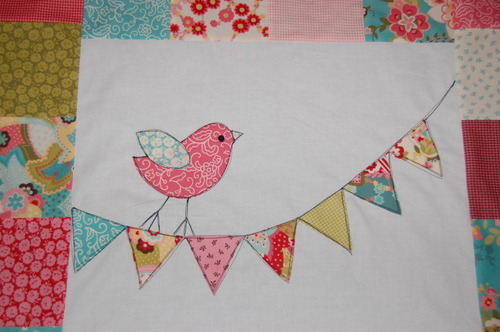 One charm square for the little bird, a scrap for the wing and a scrap of black felt for the dot of the eye. I used wonderweb to fuse the pieces to the fabric and then rougly outlined everything on the machine a couple of times using black thread. Trying to be imprecise goes a bit against the grain, but it was fun, and gave it a “drawn on” effect (as it should be apparently). Then I sewed two strips of 4 charms with 1/4” seam allowance, centred it, sewed to opposite sides of the picture and trimmed the excess. Next I sewed two strips of 6 charms and did the same to complete the “frame”. 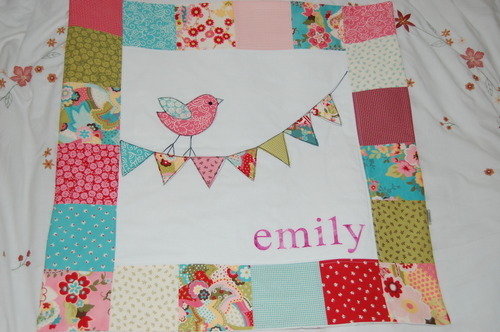 I added Emily’s name in pink – I used an alphabet die in my BigShot with Steam-a-seam2 fusible web, but could have printed the “emily” in Times New Roman font as big as would make the letters about 2” tall, traced it onto the Steam-a-seam2 BACKWARDS, ironed it onto my fabric and cut it out. A bit faffy but worth it. I hand stitched round to secure so as not to lose the neat lines. And it was all done. It looks quite pretty on the little sofa in the corner of my bedroom. Who says pretty bird pictures are just for little girls? 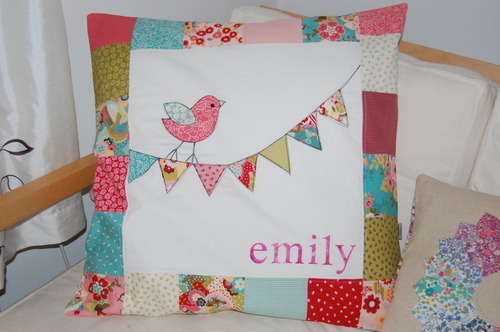 Good thing for her that it has “emily” well and truly stitched on. And the reaction? Emily’s mum loved it. Ooohs and ahhhs from the other mums. Emily toddled off precariously to empty the contents of a kitchen cupboard onto the floor, pretty much oblivious. Emily’s 4 year old big brother said “But it’s the wrong ‘E’”. “It’s art,” I said. “It’s modern”. “It’s wrong,” he said, and busied himself playing with one of Emily’s OTHER, not-wrong gifts. Pah. I’m going to spell his name wrong when I make him one.